Before we get to the list of pros and cons of debt funding vs equity funding, let’s ta ke a minute to understand why this is so important. The problem is that at least 50% of new businesses fail inside the first five years, and the number increases to more than 85% by year 10. To avoid landing up in this long list of failed businesses, you need to: Join Yomillio For FREE! A) Create a business plan that lays out your growth and finance plans for the next 3-5 years. B) Apply for finance only from sources that are suitable for your business. The latter point is what we want to focus on here. Specifically, should you borrow money, i.e. 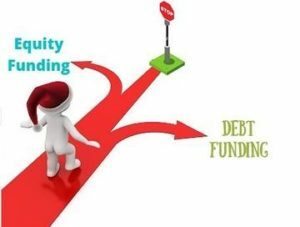 take debt funding, or look for investors / business partners for equity funding? Advantages of debt funding – 1) It’s easier to find and apply for loans, credit cards and overdrafts, trade credit and other types of debt than it is to find and raise funding from investors and partners. 2) No dilution of business owner’s stake, since you retain full ownership. 3) By the same token, you don’t have to share profits. For example, let’s say you need Rs. 10 lakh in working capital to take on a large new project. You can get a short-term loan or revolving credit facility from a bank/ NBFC. The application process is relatively easy and fast, needs less paperwork, and you can pay it off quickly once the project is complete and you get paid by the client. On the other hand, if you choose to bring in an equity investor or business partner, they will insist on partial control over your company and management, and they will still be there after the project is over. They will get a share of business profits not just from this one project, but from every project your company takes on going forward. Disadvantages of debt financing – 1) Needs to be paid back, regardless of whether you are generating enough revenue to meet monthly repayments. This can hurt start-ups and new small businesses that don’t have enough sales and revenue in the early stages. If you have to give to the bank whatever little money you earn every month, it leaves nothing to meet business and personal expenses. 2) You have to pay interest, in addition to repaying the principal amount. 3) Secured loans may require you to mortgage assets. 4) If you are not able to repay the loan and default on it, the lender can seize mortgaged assets and even your whole firm itself. Depending on the business structure, you may also be personally liable if your business is not able to pay off debts, in case the lender insists on a personal guarantee. If a company defaults, the name of the defaulting company and its Promoters are reported to credit bureaus, making it very difficult to get credit in the future. 5) In cases wherein there is capital expenditure involved for procurement of assets like machinery, vehicles, etc., financiers expect the borrower to come up with down payments. These funds are often hard to manage. 6) Debt capital should ideally not be deployed for risky investments like advertising, R&D, new product launches, etc. Advantages of Equity Funding – 1) Unlike loans and other forms of debt, you don’t have to start repaying equity investors right away. They don’t get anything until you start making a profit and issue dividends. 2) Also unlike loans, there is no interest to be paid, which frees the business from fixed outflows. 3) If your business fails, neither you nor your business are liable to pay your investors, unless specifically agreed to. 4) Equity investors, unlike bank managers and other lenders, tend to be successful business leaders and mentors who can share their expertise, connections and other resources. Some investors (partners, venture capitalists, etc.) may also be active in helping you manage the business and decision-making process. 2) You have to share profits with investors, in case dividends are issued. 3) It takes a lot of time, paperwork and compliance to fulfil all the requirements of equity investors, and that’s before they even agree to invest. 4) Your business may not even qualify for equity funding, if you are not able to demonstrate the high-growth potential and capabilities that investors want to see. 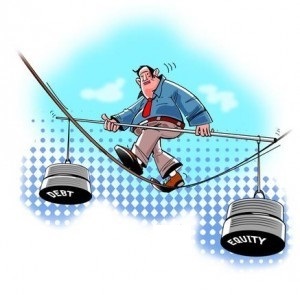 In a nutshell, both equity and debt investments have their own pros and cons. As such, it is recommended that family held firms who have existing cash flows but limited willingness to dilute control should use unsecured debt funding to fuel their business growth. On the other hand, new age start-ups should use more of equity funding because getting debt funding is a huge challenge for them, given that there is little or no track record and existing cash flow. Also, promoters of such new age companies are more willing to share control with equity investors.